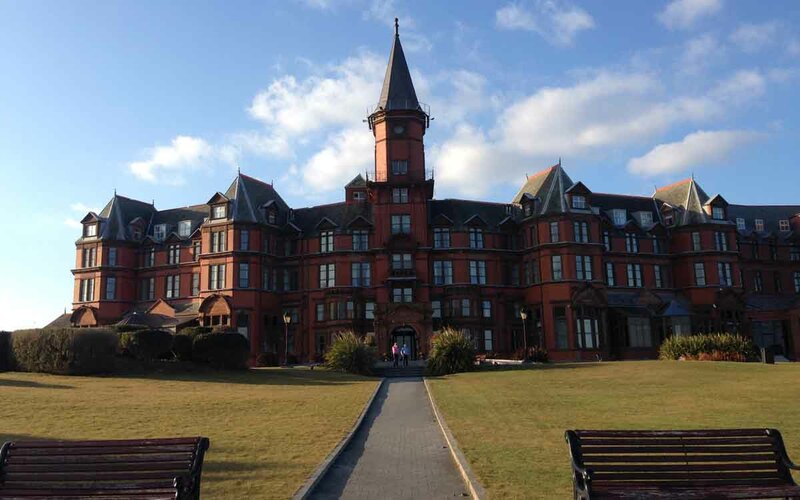 The Slieve Donard Resort and Spa, named ‘Best Irish Hotel’ at the 2012 Travel Media Awards, is a luxurious 4* Hotel situated in 6 acres of land with beautiful views of Newcastle, Co.Down. Newcastle was made famous by the well-known song ‘The Mountains of Mourne’ by Irish songwriter Percy French in 1896. The song contains the lyrics ‘Where the mountains of Mourne sweep down to the sea’, and it’s obvious by the breathtaking views how those lyrics came about. We had a Resort Room during our stay and we were so impressed. The room, with a heavenly king size ‘Cloud’ bed, was very spacious and luxurious. The room had all the usual amenities including WIFI, an iPod docking station, a hairdryer, mineral water and Tea/Coffee facilities. There was a clean white bathrobe and slippers placed neatly on the bed awaiting our arrival and a separate sofa area beside the window allowing you to soak in the stunning views of the sandy beach, the sea and the sweeping Mourne Mountains. The room included a deep soak bath and a separate shower with a rain fall head. The Spa in the Slieve Donard is fabulous! Hotel guests have access to the pool, jacuzzi, sauna and steam room and they are a must! The jacuzzi, known as the Vitality Pool, is one of the most incredible jacuzzi’s we have ever been in due to it’s size and view. It is several metres long and sits at the foot of a floor to ceiling glass wall looking out to breathtaking views. I decided to have a treatment in the Spa and I opted for a full body Balinese massage with hot lava shells. It was probably the most relaxing 80 minutes of my life! 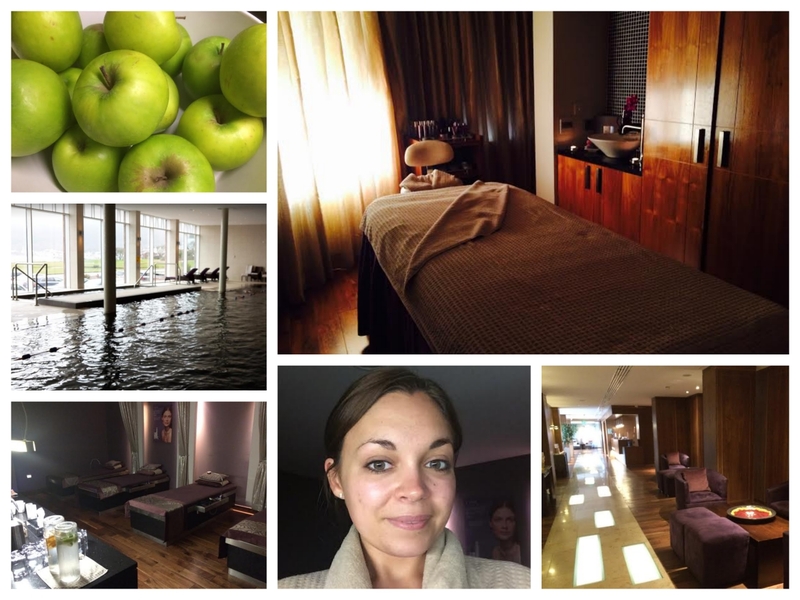 It was amazing and although a little pricey at £120, I would definitely recommend it as a luxury treat for a special occasion, I don’t think I’ve ever felt as rejuvenated. The Balinese massage incorporates long, warming strokes with heated aromatherapy oils. I could feel every tension just meit away, it was incredible. The staff in the spa were lovely too, and really helpful. They were sensitive to the fact I have Fibromyalgia- a condition where I often feel pain, even when I shouldn’t, so the masseuse suggested using hot lava shells instead of hot stones as they are smoother. To show how amazing I felt after the treatment I took a no make-up selfie and I’ve braved it and posted it below. 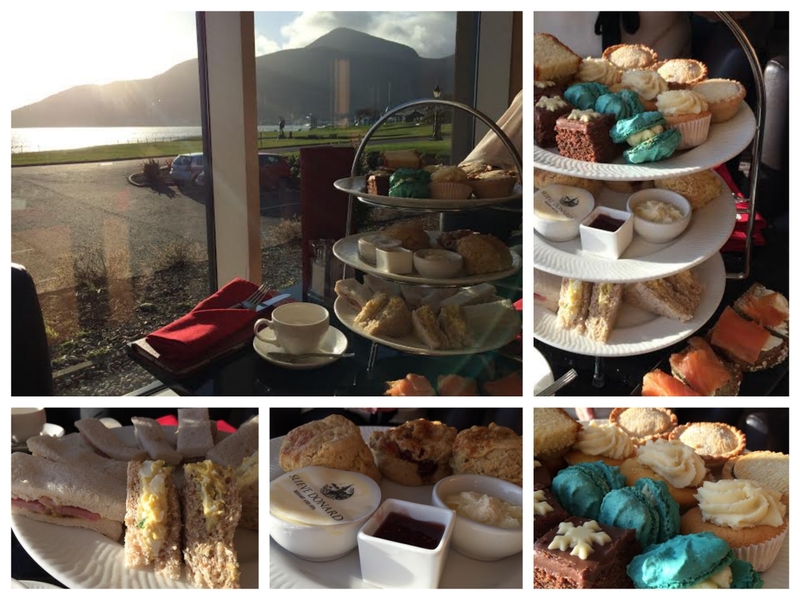 We had our Afternoon Tea in the stylish Lighthouse Lounge which overlooks the stunning coastline. We sipped on fruit teas and began to get tucked in! The bottom layer was host to a selection of finger sandwiches which included ‘Glenarm Organic Smoked Salmon’, ‘Irish Chicken Breast and Sun Blushed Tomato Tapenade’, ‘Givan’s Baked Ham and Mustard’ and ‘Homemade Egg Mayonnaise’. The middle layer had a choice of ‘Fruit and Plain Scones’ served with Homemade Clotted Cream and Fruit Preserve. The top layer was home to the sweet stuff and included Chocolate Cake, Madeira Cake, Macaroons, Fairy Cakes and Little Pies. In all honesty we were slightly underwhelmed by this section, it had a less homemade taste to it than we would have liked, but saying that we would probably head back again. 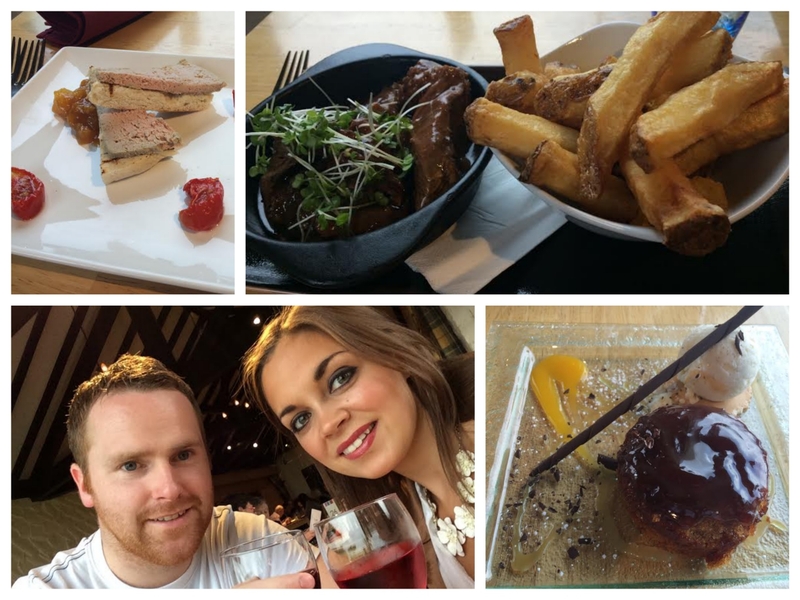 We dined at the Percy French Restaurant which is situated within the grounds of the Hotel. We chose from the Wine and Dine Menu which is available Monday to Thursday from 5pm – 7pm where you receive two courses and a glass of wine for £15 per person, with an additional £5 for a third course. To start we had ‘Chicken Liver Pâté served on Toasted Soda Bread and a Spiced Pear Chutney’ and it was delicious, especially for a self-confessed pâté addict like myself! For the main dish we had ‘Glenarm Shorthorn Daube of Beef 10oz’. As we served this deicious Daube of Beef at our wedding reception in the Slieve Donard we couldn’t wait to try it again! Served in a Red wine, mushroom and onion jus with hexagonal cut chunky ‘Causeway Chips’, it was as tender and as flavoursome as we had remembered. For dessert we chose ‘Sticky Toffee Pudding’ which was served with toffee sauce and local Glastry Farm vanilla bean ice-cream. I could eat this all day long, moist sponge with a rich sauce and creamy ice-cream- what’s not to like. We have dined several times at the Percy French and you can read a previous review of ours here. There are plenty of local attractions to visit while staying at the Slieve Donard, including Tollymore Forest Park (a must for Game of Throne fans), Spelga Dam, the Mourne Mountains and Murlough Beach. If you enjoy a round of golf you can play at the prestigious Royal County Down Golf Links, home of the Irish Open 2015, and situated directly behind the hotel. The course is voted number 1 in the world by Golf Digest in 2016, with number 2 being home of the Masters ‘Augusta National’, Georgia. Check out our video below of things to do in Newcastle, Co.Down. 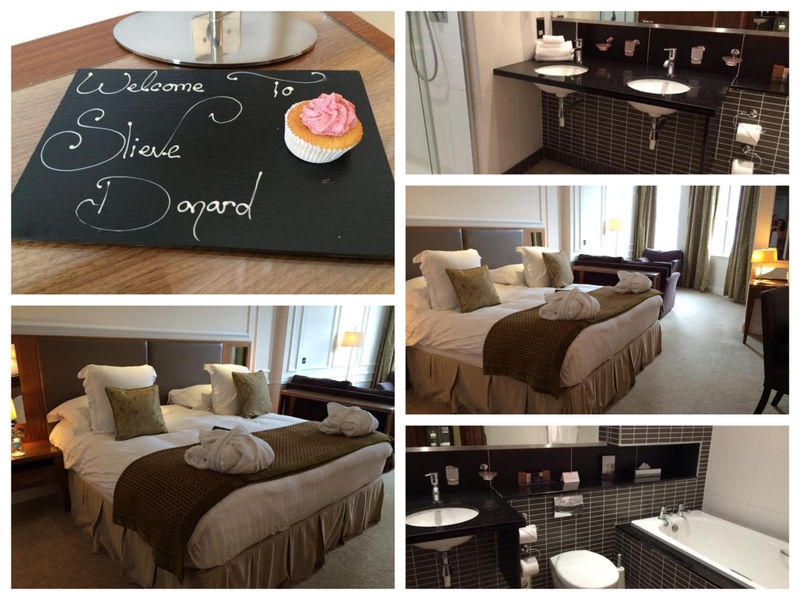 Have you stayed in the Slieve Donard Resort and Spa before? Have you had any treatments in the Spa? Or have you dined in the Slieve Donard or the Percy French? Comment below or connect with us on Facebook and Twitter.